Karmada Arts: Nekocon 2014 Convention Recap! Now that it's been about a week since the show, and I'm almost recovered (let me tell you, one very stressful show followed by a relaxing, but very far away show has been really draining on me, whew! ), I figured it was time for the Recap/Review of Nekocon 2014. Naturally, I forgot to take ANY pictures, so we'll go the humorous animated Gif route. -__- I swear, one of these days I'll remember to take pictures. For the record, this was my very first time attending Nekocon, and given that I had to drive about 10 hours, that's gotta say something. They impressed me enough to make me curious enough to drive out there. ALSO, this review is from the Artist Alley side, if you're looking for a review of events or shows, you've come to the wrong place, as I saw the backside of a table ALL WEEKEND. Anyway, I'd like to highlight some interesting things about this particular alley - it was one of the first fully juried events I managed to get into. I was first placed on the wait list, but then made it in soon thereafter, so to whoever's place I took: THANKS! I had a BLAST! They had all sorts of categories that people could be placed into, as well as some "pro row" seats, which are very tempting mind you, they had things like 3-D, Traditional, Webcomic, and all other manners I'm not remembering at the moment. I figured, what's the worst they could say? No, you're not in? All I'd have lost is minutes of my time in the sign up process. I liked that they had all sorts of Categories, and actually took "traditional" into account (mostly so they don't have an overabundance of the same type of 2-D art, but it really made me feel welcomed). Already my interest was peaked. I also noticed after a bit of research that the show is what I'd call "Shuto Con Sized", where it's bigger than a small convention, but it's not nearly as huge as say Anime Central. And I know I do pretty well at Shuto, so WHY NOT GIVE IT A TRY? I could gush about this show for hours, but that's also probably because I had just come off of my Youmacon push, which was quite possibly the most frustrating convention experience I've ever had. I was looking forward to a relaxing experience. + The show was set up in a separate room from the Dealers. In a lot of shows,this makes people antsy, especially if it's a newer show. But this one's on it's 17th year, so I had faith in it. Also, is this an east coast thing? Because Katsucon does this too. I was even placed in the very back, and I still did well. The people who came into the alley area were definitely interested in artwork, artisan products, comics and the like. I sold a decent amount of comics and sketchbooks, along with garnering interest for Sky's at the same time. I got to buy a bunch of comics from other artists in the alley. It was very art positive. + Friendly Staff. Prepared Staff. When I arrived Thursday night, we ended up going in the wrong doorway, and talked to the volunteer guard there and said "Artist Alley Checkin?" and instead of yelling at me to go to another door, he immediately pointed me to the alley, and said "Have a good weekend!" 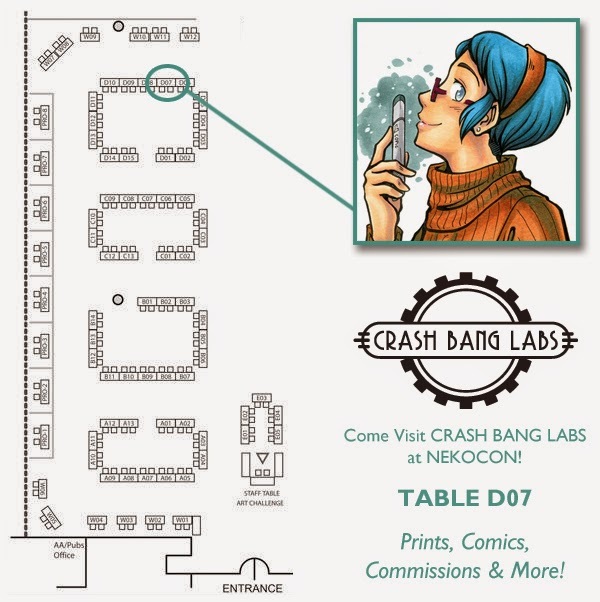 At the table, they had the map laid out, as well as badges with my booth name on it. WTFFFFFF. Where was I? Was this some other dimension? I was also greeted happily and sent on my way to my booth. + Caring Convention. I heard that apparently they were having problems with the PayPal system in registration resulting in an unexpected LineCon. According to Husband, who was running out to get things like food, water, supplies, he noted that they had staff all along the line helping to chat/entertain the guests, as well as providing cups of water to those standing (and I would assume holding a spot if they had to use the restroom). Everybody joked about LineCon, but I never really saw any true vitriol from the attendees themselves. + Signs & Programs. They had very clear signs! Upon checking in and getting to my booth, I HAD A SWAG BAG WAITING FOR ME. That's right! A bag with a program, a schedule, and some other miscellaney coupons for local stores. I didn't have to hunt down a program. I didn't have to hope I'd find one. I GOT IT FROM THE START. + Survey. On Sunday, I approached my table and saw they had left me a feedback form ON MY TABLE. Guys, I just had to fill it out and give it to staff. Like, no going online, no trying to remember, I could just give them feedback RIGHT AWAY. And they really wanted to make sure we were all taken care of, and that we liked the show. Overall, it was very nice! As with all conventions, not everything is roses. I didn't really have too many complaints. - ISLANDS. WHYYYY. It wasn't nearly as tight or bad as Youma, and thankfully I did not have a corner booth, but still. Please, can we all graduate to rows? Pleeeeeeeease? - Killer Hours. I know we were in a separate room, and we did happen to have the Tabletop Gaming nearby (which was cool) as well as Autographs and the Art Show, but man... a 12 hour shift? Our hours on Saturday were 10 am to 10 pm, and yes, we DID have people roving the halls late in the evening (since the dealer's closed at 6), but man, I haven't hurt that much in a long time. I was never so glad to fall asleep in a discount hotel bed. I like longer hours, but can we shorten them a leeeeetle bit? - Killer Drive. I have plans on how to tackle this next time. Apparently Mountains and I do not get along at the moment. Not the con's fault, just thought I'd gripe more about freeways here. - Lack of Communication on the Internet. They don't have a specified forums, and I only discovered they had an FB group two days before the show. Emails were infrequent, if not entirely non-existent, so I was kind of worried if I was properly paid, still in, and so forth. They did get us a map the week of the show though, which was really nice (apparently it was a first for them). * More Email/Internet Communication. I know y'all are volunteers, but please! Show us where we can go to find more information. I'm used to dealing with forums, and talking with the other artists/staff, and for those of us coming from far away it's nice to know we're still actually in the show. * Change the Hours Slightly? 12 hours are killer, 10 hours maybe? I can handle working 10 - 7 or 8, but that 12 hours was killer. * Rows Rows Rows. I'll say it till I fall over blue in the face. Can we just agree to have rows now? Are shows finally big enough to have them? Definitely! Despite some of the "problems", I really liked the atmosphere and the crowds. I would hope maybe in future years it expands a little more or gets a little more populous, but it's got a good sized crowd. In the case I should make it in again, I plan on having a lot more books and things on display (as I am in transition on what I really want my booth to be like, I've shifted around a lot of stuff)! 8/10 Would Totally Vend Again. And with that, my 2014 Convention Season has come to a close! I'm now onto getting the Etsy shop back up to snuff for the Holiday season, and heading into MAKE ALL THE BOOKS time. I've got a short amount of time, and I need to finally bust out these things I've been looking forward to making for such a long time. I'll keep you updated here, of course. ...and many others, I'm sure!